Colorful swatches of plush faux fur adds artful intrigue to this wrap-style Hutch jacket. 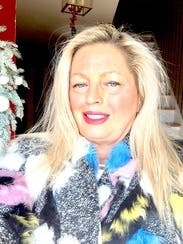 Multicolored faux fur (100% Polyester). Coat. Long sleeves. Unattached belt closure. Pockets. Fully lined. 44.5" from shoulder to hemline. Imported. 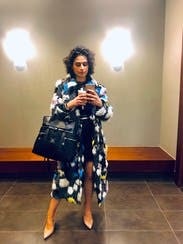 This coat is a show stopper; I wore it to church on Christmas Eve and had 7 people tell me how beautiful it is; one of them was not my husband who strongly dislikes it. The reason I didn't give it 5 stars it that it sheds A LOT. This coat is not good for someone 5'4" because I'm 5'6" and it came down to almost my ankles. If you're looking for a statement piece, look no further! Got so many compliments from strangers saying the whole get-up was just.. YES. This coat slays and is definitely a statement piece. I wore it with black booties and a blue knit comfy dress underneath. Loved the colors! It was a hit with everyone from my boyfriend's family to the restaurant staff. Pure joy. If coats could talk, this one would be laughing : ) !! 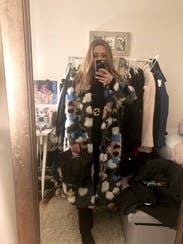 The most fun, comfy (and furriest) coat I’ve ever worn. Never have I ever received so many complements from people young and young-at-heart on a piece of clothing. People smile at me. The coat smiles back. No, wait...that’s me smiling. Friends tell me I should keep this marvel-of-faux, this “coat of many colors” because it makes them happy when they see me coming. Inspires my happiness too (more than makes up for a bit of shedding, but then again, received new-with-tags). 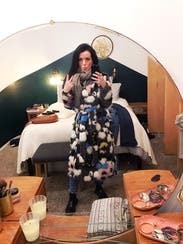 The bright colors, the multi-layer faux fur, the whole party-in-knit concept definitely brighten up grey, New England winter’s days. You will shine (and will be noticed) in this warm, knee-length wrap. Would love to meet the artist who designed this unique creation. Must be a very happy person. Rent for the pure joy of it! Went with everything. Compliments for days. loved it. It sheds like crazy. The fit is perfect, you can tighten the fit according to your figure , the fabric is light but works for a cold day . 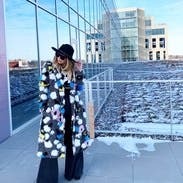 You off course need to layer pieces under, I wore it in 40 degree Nyc winter and it worked ! I got lots of stares from men and complements. I felt like a celebrity . This is the most complimented I've ever been in a piece from RTR. I was like a new puppy walking around town--couldn't get 5 feet without someone stopping me! I would consider purchasing if it wasn't so expensive! I love this coat in every way. It's surprisingly warm and it's soooo soft! So many compliments on this statement piece. This is a keeper for sure! E V E R Y T H I N G ! ! ! ! ! Statement of all statement pieces! Wore this to a work Holiday bowling party. It was definitely a conversation piece. I'd say it runs pretty true to size. I however would've liked it to be a little more snugged and will size down if ordered again. It was surprisingly warmer than I thought it would be as well. It's pretty long as well FYI. Such a statement coat! I got SO MANY compliments and comments from people. I wasn't expecting to get so many compliments but this is truly a showstopper. If I could ever afford to buy this, I def would. I need this as a permanent fixture in my closet. 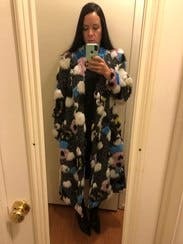 A really fun coat for wearing around. Gets a lot of notice! 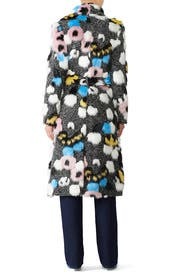 It is a really fun coat to wear around town. My usual size is a medium, but I should have gotten this in a small. It worked because I was wearing sweaters under it, but if I get it again I'll size down. Not only is it an outstanding piece, it's so comfortable!It felt like wearing a comfy robe. People stopped and commented on the coat every 5 minutes. With or without their reassurance though, I felt like a million bucks! I wore it to work, church, and even through on a sweat suit and sneakers with it. Will definitely rent again, and also, will stalk and wait for it to go on CLEARANCE! Million compliments on this. Will rent again or maybe buy it! Love the colors and the textures! This is why we RTR! Pardon my nerdy pic- i text it to my friends before I went out :) THIS COAT is amazing. It hangs beautifully and is a stretch tweed so it's warm! It's been -2 in Chicago and i layered with a cashmere scarf and was perfectly comfortable as we walked from bar to bar this weekend. It's got big pockets and can be worn casually-- which i love. I'm 5'2" and LOVED the length. I received comments all night. "...in my coat of many colors Rent the Runway made for me..." Hells YES. Finally a coat that understands who I am as a person. Warning: only wear this if you enjoy talking to people. Fabulous looking coat! SO MANY complements!! The coat is oversized, which I like. It is VERY lightweight, but because it's oversized I was able to wear a down vest or jacket underneath. However, please note there are no buttons, only a belt. The biggest issue with this coat is that it SHEDS. A LOT. Carry a lint roller and be prepared to be coughing up faux-fur for the next few weeks. But at least you'll know you made it fashion. I live In NYC, a place where people go out of their way to avoid eye contact, let alone talk to strangers. However, I've had numerous people stop me in the street and everywhere else to compliment this coat. It runs a tad large but is great quality and so much fun. This feels like a robe! Rented the large because that's all that was left and it was indeed too big. Lots of compliments. 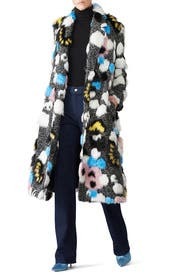 Fun coat that grabs a lot of attention! Very warm too, overall true to size. Better with a heel than with a flat shoe, glams it up a bit. This coat seriously makes a statement. I was stopped by so many people asking about the coat. Comfy, almost felt like a warm bathrobe. I am usually a small but got the medium and it was a little big, but the loose fit worked. Wore out once to a friends birthday. I was sheepish about wearing it but got so many compliments even one person asking if they could try it on! I def ordered too large as it's true to size. 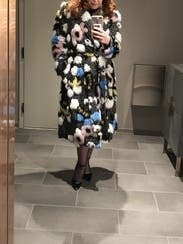 Great coat for a fun night out! The coat fits nice and roomy, could have worn a small. The fur is soft to the touch, which is a nice accent. The coat itself is not very warm, so I would only wear it for 45 degrees and higher. Would definitely rent again. Such a fun statement piece! Loved it and received TONS of compliments. I seriously was stopped on the street wearing this jacket. It received tons of compliments, photographed well, and was just a fun piece. It is lined but is NOT super warm. It's more of a statement piece. I wore it tail end of the season so it was in the high 40s and it was great. However, on one of the windier days, I was definitely cold in it, the wind blew right through the material. I didn't want to give up this beauty! Runs large. 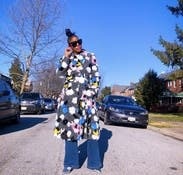 Coat is fairly lightweight, but is an absolute showstopper!!! Received so many compliments from strangers about this statement piece! If you're questioning, I say take the plunge and go for it! Only slight con is that the faux fur does shed. Loved the fit and you definitely have to be confident with it on !! The staring is only good!! It's fun and funky and not too heavy! 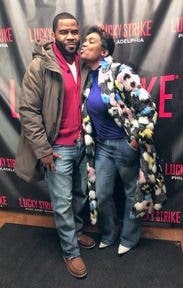 Everyone LOVED THIS COAT! Perfect for a sunny day in the 50s. Length was a little long, but the piece was overall dynamite. Love the colors! Looked better on the chair than on. 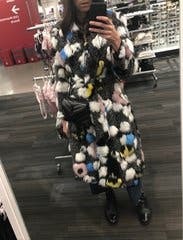 Everyone loved what it looked like when not worn and everyone at work wanted to try it on, but when we all did the consensus was that it looked more like a robe than a coat. Still fun though and no regrets renting it. It was a nice coat just not my style- I wore it once and just felt a bit silly.